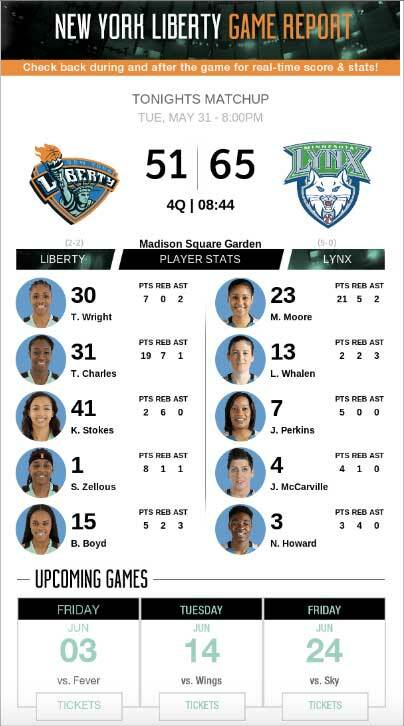 WNBA team New York Liberty wanted to give fans a great gameday experience, so they created an app-like, second screen right in their inbox. The team sent out a live game report on the day of the game. The report displayed an up-to-date score and player stats every time the email was opened. The email also included an “Upcoming Games” module that linked directly to Ticketmaster using a WNBA scheduling API—so fans could purchase tickets to future games without having to open a new browser.